It's 2059 and a large part of the land is under water. Within the confinement of The Territory people are relatively safe, but there's a cost. Creativity and emotions are being sacrificed for technology. Children can upload information into their brains, which makes school very easy. The students who can't afford this are running a high risk to fail their exams though. Not scoring enough points means being forced to leave The Territory. The students who don't pass end up at the Wetlands where there's no protection against mosquitos and the diseases they carry. Jack, Noa's best friends since they were little, was sent away and now has to survive at the Wetlands. Noa and Raf promised to help him. Leaving The Territory is their first hurdle, how will they enter the Wetlands unseen and what should they do when they are there? They have time to get ready, but supplies are scarce and they haven't got an exact idea of what they're preparing for, because the government is vague about what the Wetlands are like. What kind of life is there behind the fences of The Territory and will they actually be able to find Jack once they're there? Escape is a terrific gripping sequel to The Territory. Jack and Noa have been separated from each other and Noa wants to find her best friend and rescue him, exactly as she vowed she'd do. Her boyfriend Raf is going with her. They run the risk of sacrificing their entire future, but it's worth it if they can find Jack. I admired their courage that's being driven by love. Noa is a brave and fierce girl, she's smart, daring and complex. Raf is a nice guy with a good head on his shoulders. He's a natural survivor and he's giving Noa everything he has to give, which is very sweet. Jack isn't as clever as Noa and Raf and he doesn't have his feelings under control all the time. He's a bit of a hothead. He's also very talented and he's a loving and caring person. There are plenty of emotional problems between Noa, Raf and Jack and it was interesting to see how they would develop. Sarah Govett understands love and all of its complications and she uses this to make her story both beautiful and intriguing. The Territory and the Wetlands are fascinating places to read about. Sarah Govett writes about a world where water is the greatest enemy of the land and what will happen to humanity when most of the areas that used to be habitable have disappeared. I love her theory and her ideas of what life could be like when technology advances at a rapid pace, but space to live decreases unimaginably. I like her way of thinking and enjoyed her vivid descriptions of the world she's invented. What she writes about could be a real possibility, which makes her story even more compelling. I highly recommend both The Territory and Escape, they're fantastic well written stories. If you like dystopia you should definitely read this series. It's best to read The Territory before Escape. 1) Could you name three random facts about yourself? 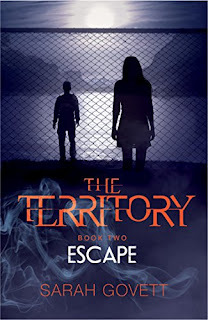 2) What inspired you to write The Territory? It was mainly my work as a tutor these last 12 years, helping young people prepare for exams. I wanted my novel to reflect the horrific pressure exams place on teenagers, the unfairness of our education system whereby results are as much determined by quality of school as natural intelligence and society’s elevation of logical subjects above more creative ones. 3) Can you describe the main characters of the series in six words each? 4) Noa, Raf and Jack need their survival skills, how did you handle the research about this part of your book? I spent some time looking into possible water purification techniques and natural mosquito repellents and used that as a springboard. The rest came from my head! 5) Your story is set in 2059 and floods have decreased the land people can live on, do you think something like that can actually happen in the near future? I do. And it terrifies me, particularly as I have two young children. It seems that the majority of scientists agree that we are approaching a tipping point and if we increase carbon dioxide levels beyond a certain (near-met) level, our planet will suffer irreversible catastrophic damage, one facet of which will be widespread flooding. This is not the time you want a climate change denier in the White House! 6) What do you like about dystopia? I like the way in which it explores issues facing humanity in a non-preachy way and also the way in which it examines the darker side of humanity. Dystopia often asks one of the most interesting questions I think you can ask yourself – how far would you go to protect the ones you love? 7) Where do you write and where do you read? I write in coffee chains where they don’t mind if I sit for an hour and a half with one drink. I don’t have as much time to read as I’d like at the moment so it’s really only before bed and on train journeys. 8) You work for and with children, can you tell what's the most wonderful thing about it? The enthusiasm, which is never faked. When a child or teenager gets something for the first time or is inspired by something there is this contagious energy. 9) Which elements of your book are experiences children from this era are also struggling with and what should be changed to prevent a system like the government system in The Territory? The stress from exam pressure is definitely a real phenomenon. Lots of very bright children simply fall apart in exams and feel like the world is ending. The bias towards logical subjects at the expense of creative one is real too. Many super smart kids just can’t compute maths and physics and feel somehow lesser for it. However, more creative subjects must be valued too as they engender empathy and in our fractured society, empathy is something we need more than ever at the moment. 10) Love is a universal theme and it's also a large motivator of your main character's actions. What's so fascinating about it? I think love brings out the best and worst in people. It can motivate one to sacrifice everything for the sake of another, to tear up their normal moral code. However, others can be destroyed in the process. I’m currently writing book 3 of The Territory and have finished a different alien body-snatchers book I’m about to take to publishers. I love dystopia fiction, one of my favorite genres. I will definitely check this book out. It sounds amazing! Thank you for the review. This series is in my dystopia series top three, I love it. Thank you for the review. This is a new author to me and I love meeting new authors. Thanks for the review! The book sounds great, I would love to read it. Sounds like a fascinating book about important issues.